March 2018: The Juneau Raptor Center is saddened to announce the passing of our beloved education red-tailed hawk, Brutus. Brutus (red-tailed hawk) (Buteo jamaicensis) Brutus is a feisty red-tailed hawk with a classic red-orange tail and striking feather pattern. 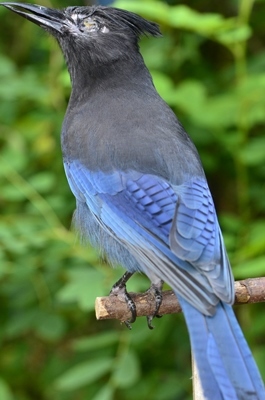 She was found in Juneau at mile 38 at the side of the road on August 24, 2003 unable to fly. Her wings were undamaged, but she was blind in her left eye, appeared to have a head injury, and was very hungry. JRC volunteers nursed her back to health, but Brutus was unable to adapt to the loss of her eye and now flies in circles when attempting to fly straight. 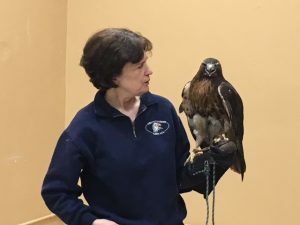 Unable to hunt, Brutus was trained as an education bird and now makes frequent public appearances, often in the company of JRC’s other red-tailed hawk, Monalisa. When she first arrived at JRC, Brutus was only a few months old, as evidenced by her dark, non-red tail. JRC volunteers were uncertain of her species until the red tail grew in with her first molt the following spring. When she was several years old, Brutus began plucking a brood patch from her belly each spring in preparation for nesting and also enjoys working with nest-building materials. After eleven years visiting with countless Juneau residents and visitors, we are sad to report that our unique red-tailed hawk, Monalisa, passed away this summer in her mew. Mona’s speckled chocolate brown feathers, yellow eyes, and mottled tail were spectacular, but they made it difficult to identify her species when she first arrived, as most red-tailed hawks sport the characteristic red-orange tail and a variety of colors on their bodies. 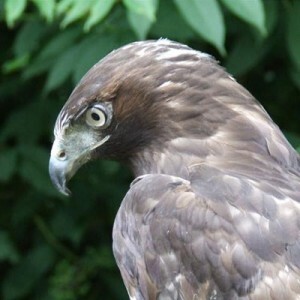 At one time, Mona would have been called a Harlan’s hawk due to her unusual plumage, but these dark birds are now considered a color phase of red-tailed hawks and tend to be found in the northwest region of North America. We enjoyed how puzzled people were to discover that she was a red-tailed hawk and that red-tailed hawks are found in Juneau. After probably hunting or scavenging along the wetlands, Mona came to JRC after flying up from the edge of Egan Drive near Vanderbilt Hill on December 4, 2004. Mona’s right elbow and humerus were damaged in an impact with a car and the former injury could not be repaired (the elbow was permanently dislocated). When the wing healed, the elbow froze in place, preventing her from extending the wing. Thankfully, Mona’s mellow temperament made her a good candidate for an education bird and her plumage was an interesting contrast to JRC’s other red-tailed hawk, Brutus; consequently, she was trained over the course of six months to sit comfortably on her trainers’ gloves and visit with the public. We originally believed she was male, so she was called “Mo” for several years until a blood test revealed that Mo was actually female, leading to her name Monalisa. Mona lived most of her life in a large outdoor mew next to her caretaker’s house. The 10’x14’ enclosure has slats on most of three sides, allowing light and air and sound inside. Because she could not fly, the mew was furnished with a network of perches allowing her to jump in two-foot increments from the ground up to the highest perches and then to every section of the mew. She used all of her perches during the day, but favored the two highest perches in opposite corners of the front wall where she could look out over the driveway and the surrounding forest. She had an elevated water dish (as she did not like to come down to the ground to bathe) and spent every night in a hide box that was heated during the winter. We hope that Mona’s years with us were pleasant and we know that many people, including her caretakers, took great pleasure in knowing her. She passed away, apparently peacefully, for unknown causes on a summer morning while sitting on one of her favorite perches. It doesn’t seem like it’s been 6 years since Nugget joined the JRC team. As a matter of fact, it only seemed months ago that Nugget was transferred to us from the Southeast Alaska Wildlife Center in Ketchikan. It was a day of mourning when the news of Nugget’s passing spread throughout the Juneau Raptor Center. Nugget was a barn owl that joined the ranks in March of 2009. It was never determined if he was born with or had sustained an injury to his left foot/leg that left him unable to grasp. 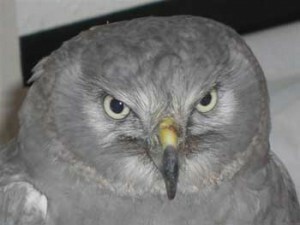 Being unable to capture food, Nugget was deemed non-releasable and placed in the care of an experienced raptor handler. Together they educated the public about raptors as well as other birds of Southeast Alaska and how everyone can make a difference in helping these magnificent creatures. 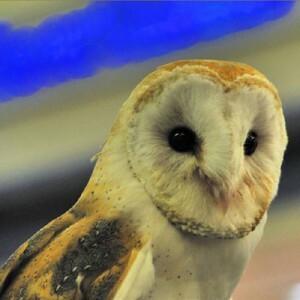 Although barn owls are not native to Southeast Alaska, they are found on nearly every continent and are very adaptable, as Nugget soon exhibited. Barn owls have many unique features that separate them from other North American owls. For example: they are the only North American owl that has a heart shaped facial disk and the only one whose middle talon is serrated and believed to be used in preening its facial feathers. There were other things that made Nugget unique from his counterparts as well, such as the distinctive sound he made whenever he felt someone was getting too close to him. This sound was similar to television static! A sound that will always be remembered. We thank all those who adopted Nugget to help pay for his medical care, fresh food, and a comfortable home. JRC is sad to report the passing of AJ in October 2009. 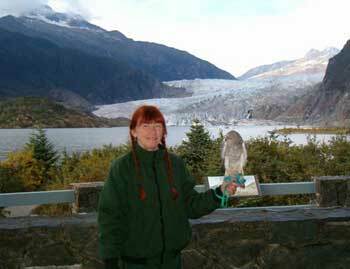 I first met AJ when the Juneau Raptor Center had our exhibit mews at the Gold Creek Salmon Bake. He had come to us in November of 1994 with severe burns on his legs, probably from contact with an electrical wire. He was found injured near the AJ Mine, hence his name. His injuries healed with the care of JRC volunteers, but he lost his front talons on both of his feet and was considered non-releasable. He eventually was housed at the Salmon Bake where we presented our exhibit birds in hopes of educating and raising funds for JRC. When we moved from the Salmon Bake site, AJ was housed at a volunteer’s home. When my husband Bill and I bought a house out the road, we found ourselves with a building that could be used as an enclosure (also called a mew) to keep one of our education birds. AJ seemed to be the perfect bird since he was not yet trained. So we brought AJ out the road and Bill and I worked with him all that winter. We found that he was very responsive to contact with humans and very comfortable with crowds. By Spring 1995 AJ was ready to present programs at schools and community events….he was a teacher. AJ required different accessories than most raptors that we use for education. He couldn’t grab onto leather gloves without his front talons, so I used knit gloves with padding inside that he could grab on with his back talon. His legs were fragile with scar tissue, so I made fleece jesses (ankle “bracelets”) with snaps instead of the usual leather ones, and they had to be put on each time he had a program. This was a fun task as I made different colored jesses for him in the different seasons. 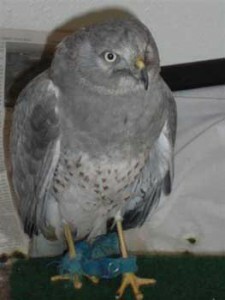 AJ was a Northern Harrier, a type of hawk that hunts like an owl by using the circular areas around his eyes to concentrate sounds of prey towards their offseting ear openings. I found it interesting that young children often thought that he was an owl, noticing the resemblance. We traveled to the Wrangell Garnet Festival and to five Haines Bald Eagle Festivals. He wasn’t the largest or flashiest of education birds at these events, but it seemed that everyone was interested in learning about him. His incredible sense of hearing made him a bit jumpy, but he put up with hours of public attendance. Whenever he was tired of it all, he would grab my arm and his back talons would pierce my arm to let me know it was time to go. AJ enjoyed the luxury that all of JRC’s education birds do. He had special flat perches to accommodate his lack of talons. Since Harriers are low-oriented birds and roost close to the ground, he had logs and rocks as well as the perches. In the winter months, he had 14 hours of supplemented lighting and a heated water bowl to compensate for migrating south. In his later years, we brought him inside if the temperatures dropped below 20 degrees and doubled his feed to keep his body temperature normal. In the summer, I tethered him out while I worked in the garden. I feel very fortunate to have had AJ in my life. He helped me to create interest and responsibility for our birds and our environment in so many children and adults. We had regular weekly programs at the Mendenhall Glacier Visitors Center during the summers of 2005 and 2006, where he met hundreds of visitors to Alaska from all over the world. His last program at Glacier Valley school was just a day before he died (October 2009), and the children were fascinated by this little raptor. AJ was a remarkable example of the impact that our education birds can have on the public, he will never be forgotten and we will all miss him.